Christmas Day, 2013~”You are immense, and you made yourself small; you are rich, and you made yourself poor; you are all-powerful and you made yourself vulnerable,” Francis said of Jesus as he delivered his homily in the Basilica of Saint Peter, packed with faithful. 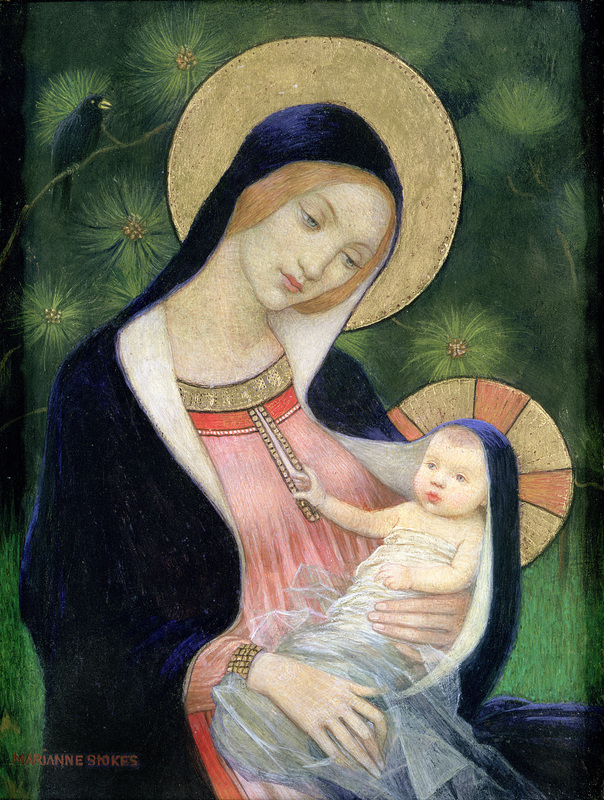 Mary and the Christ child are depicted in the painting “Madonna of the Fir Tree” by Marianne Stokes. 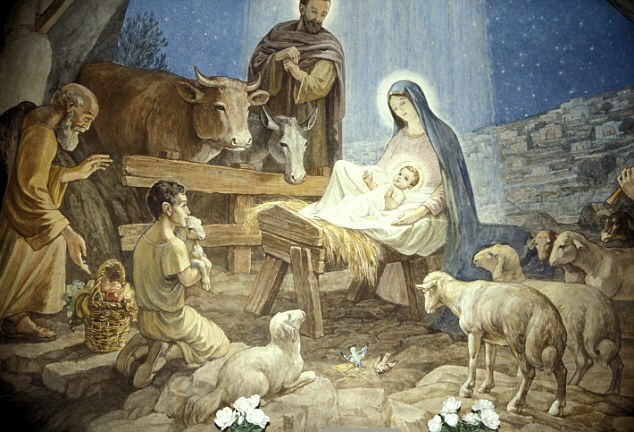 The feast of the Nativity of Christ, a holy day of obligation, is celebrated Dec. 25. 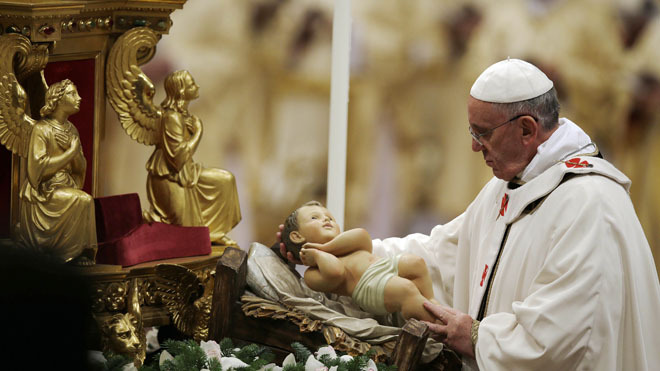 VATICAN CITY – Pope Francis lauded Jesus’ humble beginning as a poor and vulnerable baby as he celebrated his first Christmas Eve Mass as pontiff Tuesday in St. Peter’s Basilica. “You are immense, and you made yourself small; you are rich, and you made yourself poor; you are all-powerful and you made yourself vulnerable,” Francis said of Jesus as he delivered his homily in the basilica, packed with faithful. Francis has dedicated much of his nine-month-old papacy to drawing attention to the plight of the poor, of children, and other vulnerable members of society. Francis, who turned 77 a week ago, walked briskly up the main aisle of the basilica for the ceremony, which began Tuesday 2 ½ hours before midnight. Keeping with the theme of humility he has set for his new papacy, Francis carried the statue instead of an aide, and kissed a knee of the figure of the newly born Jesus. The occasional wail of babies in the basilica contrasted at times with the sweet voices of the choir. Francis has applied this same vision to the heart of the Vatican’s own working, saying in past remarks there is no place for person ambition in the clerical hierarchy. Rather, he has insisted, the Catholic church must be one of service to those in need. Earlier, in the Holy Land, thousands of Christian pilgrims from around the world packed the West Bank town of Bethlehem for Christmas Eve celebrations, bringing warm holiday cheer to the biblical birthplace of Jesus on a cool, clear night. The heavy turnout, its highest in years, helped lift spirits in Bethlehem as leaders expressed hope that the coming year would finally bring the Palestinians an independent state of their own. “The message of Christmas is a message of peace, love and brotherhood. We have to be brothers with each other,” said Latin Patriarch Fouad Twal, the top Roman Catholic cleric in the Holy Land, as he arrived in town. At the Vatican, the basilica ceremony is the pope’s only public Mass for Christmas. On Wednesday, Christmas Day, Francis will deliver his Christmas message, meant for the world, from the basilica’s central balcony overlooking St. Peter’s Square.